I plan on bringing quite a lot of my art with me - 5 original pieces, 30 plus giclée reproductions on canvas, 4-5 reproductions on birch wood, and plenty of paper giclée prints. Below is the complete list of canvas giclée prints I am bringing. I know matching the titles with the images is near impossible, so you just have to flip back and forth between this page and my prints page. post festival note - Wow. Traveling to Arizona was such a big risk - especially during the school year. But, it ended up to be so worth it. I had a great show. The festival organizers were so awesome, the patrons were so awesome, and overall it was a great experience. I am so glad and I’m looking forward to next year (but not the drive!). 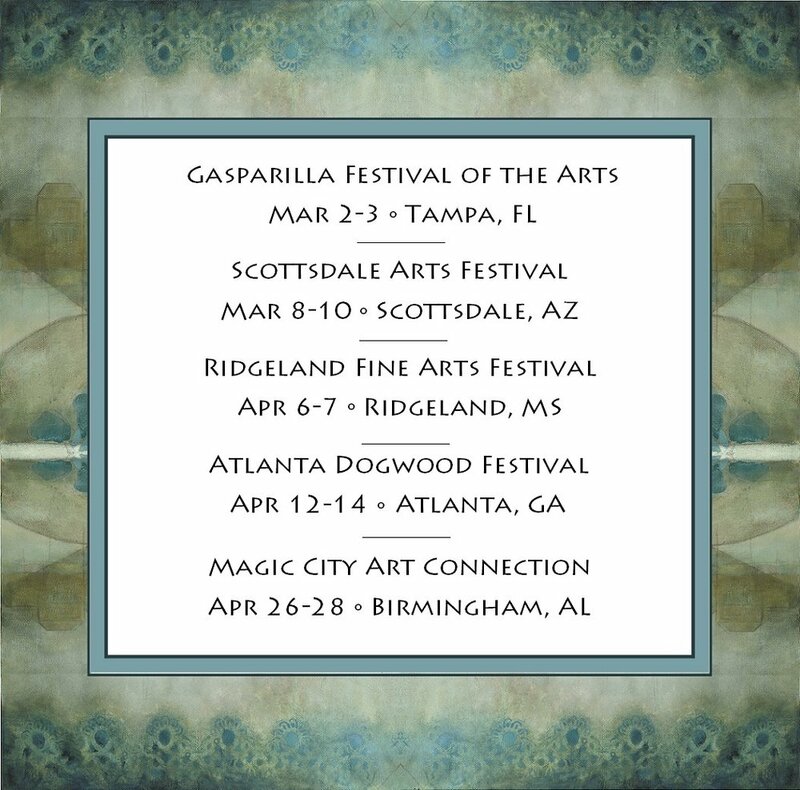 I’ll be in Tampa March 2-3 for the Gasparilla Festival of the Arts. The hours are Saturday 9am to 6pm, and Sunday 10am to 5pm. My booth is in the same place as last year - number 93 which is across from the music stage. post festival note - another great weekend in Tampa - the venue is just gorgeous and the weather was almost perfect - maybe a little hot ;). Hopefully, I’ll be back next year! You’re definitely invited to come along! The weekend of January 25-27 I will be in New Smyrna Beach for Images: A Festival of the Arts. The hours are Friday 1pm to 5pm, Saturday 9am to 5pm, and Sunday 10am to 4pm. My booth number is 185 - which is on Canal Street kinda far down almost to the end. So please don’t miss me! I plan on bringing with me 5 original pieces. I'll also be bringing 25 plus giclée reproductions on canvas, 3-4 reproductions on birch wood, and plenty of paper giclée prints with me. Below the complete list of canvas and wood pieces I am bringing. If you want something specific that is not on the list then please email me by January 15th. Okay that’s all I hope to see you there. The weekend of December 1st and 2nd, I will be in Gainesville for the Downtown Festival and Art Show. The hours are 10am – 5pm on both days. My booth number is 43 - which is on 1st Street right in front of Harry’s Seafood Bar and Grill. I’ll be bringing 5 original pieces, 25 or so canvas giclée reproductions, 4 pieces on birch wood, and lots of paper giclée prints. Thanks and see you there! Post Festival Note - Well, the weather totally didn’t cooperate on Saturday and Sunday always had a threat of rain it seemed. So, in the end I kinda closed the year with a drizzle. ;) Still, Gainesville is the town I was born in so that’s kinda nice I guess. I’m done traveling til 2019. Thanks to everyone who came out all year long. The weekend of October 27-28 I will be in downtown Ocala, FL for the Ocala Arts Festival. The hours are 10am – 6pm on Saturday and 10am to 5pm on Sunday. Here’s a link to their website if you want more info: FAFO. Post Festival Note - I had a wonderful time in Ocala. I can’t even believe it but I won Best in Show!!!!! I’m still stunned. :) The weather was gorgeous. And the people were fabulous. The whole thing was just awesome. Post Festival Note - Blue Ridge was everything I had hoped. It’s was chilly. It was beautiful. It was slow paced (in a good way). And it was successful in terms of art sales. :) Thanks to all who came out. Well, I’m headed to Texas and I’m pretty excited about it. :) I love taking my art to new places. Even more so this time because this is a huge city (or metro area I guess) and this is a big time show (judging by the other artists that are participating). So I’m optimistic as can be that it will be a great weekend. As always, the titles and images are tough to match up, so flip back and forth between this page and the prints page if you need. Thanks and see you there! The weekend of September 21-23 I’ll be back in Charlotte and will be showing my work in Freedom Park at Festival in the Park. The hours are 4pm to 9:30pm on Friday, 10am to 9:30pm on Saturday, and 11am to 6pm on Sunday. For more info about parking and other events happening that weekend, feel free to follow this link to their website - Festival in the Park. I believe my booth will be in the same location as last year but, I haven’t actually received confirmation of that. If they move me I will post a follow up. I’ll be bringing 5 original pieces, 40 or so canvas giclée reproductions, 2 pieces on birch wood, and lots of paper giclée prints. Below is a list of the canvas giclees and birch wood pieces that I will have. The list is still evolving somewhat so there could be some minor changes. As always, the titles and images are tough to match up, so flip back and forth between this page and the prints page if you need. Thanks and see you there! Another great show in Charlotte. The weather was perfect and the setting in Freedom Park is so picturesque. It’s a great event which was made even better when I won the 2-D Judges Choice Award! :) Thanks to everyone who came out! After we left Madison, Toby and I headed to northwestern NC for a show in Banner Elk (a tiny town close to Sugar and Beech Mountains). My folks were kind enough to meet us there and bring our kids along with them. We got there a couple of days before the show started and stayed an extra day - which was plenty of time to take in some hikes and even go zip lining at Hawks Nest. We loved it. About the show - it was the smallest show I'll do this year, yet it went remarkably well. The patrons took to my work and, while I didn't break any sales records, I did really well, totally above expectations. :) So I am totally hoping to do it again next year. Maybe even staying longer. I am just so in love with the mountains. The weekend of July 14th-15th I will be in Madison, WI for Art Fair on the Square. The hours are 9am to 6pm on Saturday, and then 10am to 5pm on Sunday. My booth location is the exact same as last year – booth 234. It's on Carroll Street kinda by Fromagination. I’ll be bringing 6 original pieces, 50 plus canvas giclée reproductions, 4 or 5 reproductions on birch wood, and lots of paper giclée prints. Post Festival Note - I love Atlanta (and I really love the Virginia Highlands neighborhood) but I didn't really have the best show as far as sales go. Toby says the bar has been set too high from previous shows (esp in Atlanta). Regardless , I thank everyone who came out braving the super hot weather - summer is definitely in full swing. Next stop Madison, Wisconsin. I don’t know our booth number yet – I will post it once I get it. My booth number is 450 – which is more like where I was in 2015 and 2016. Thanks to everyone who came out to the show. It was by far my best year for sales and I am very grateful. Also, I was fortunate enough to win an award which means I am an automatic invite for next year. She’ll be bringing 6 original pieces, 40 plus canvas giclée reproductions, 2 reproductions on birch wood, and lots of paper giclée prints. Thanks to everyone who came out. I appreciate the support. I definitely feel the love every time I go up there. Speaking of which, we will be back in Atlanta for the Virginia Highlands Summerfest June 9th- 10th.